If you ever want to feel fancy with doing the least amount of work possible, make chocolate peanut butter cups. 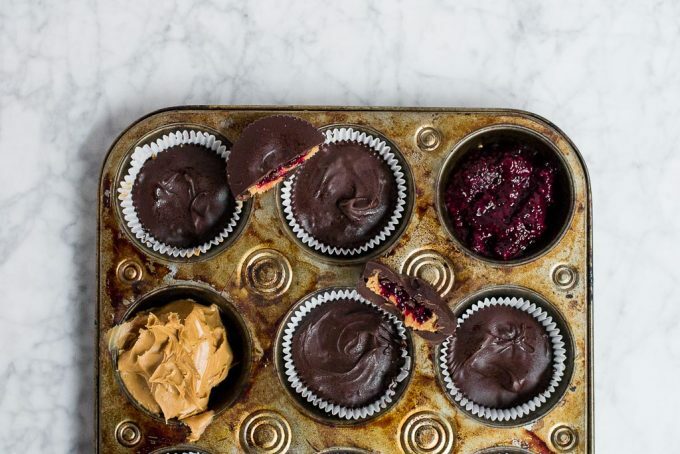 Now, if you want to do a extra little somethin’ somethin’, make these chocolate CHIA JAM peanut butter cups! 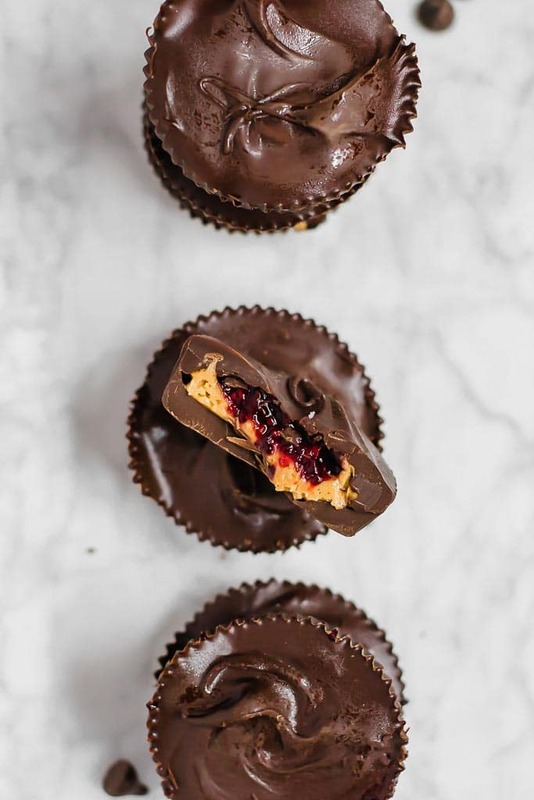 Now, I realize that chocolate peanut butter cups probably aren’t considered fancy, but I feel like any time you make a layered dessert you can use the word fancy. And peanut butter cups are just that… layered! A little chocolate, some peanut butter mixture, a dollop of berry chia jam, and top it all off with chocolate! Can you say YUM!?!? I think I legit just heard you all say it through the computer. YUM! For this recipe you will need: frozen berries, granulated sugar, chia seeds, peanut butter, powdered sugar, and chocolate chips. That’s it! 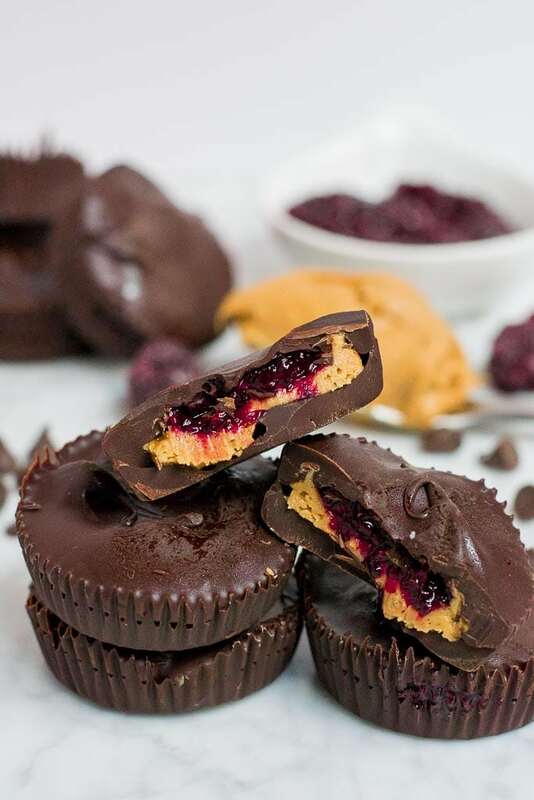 These chocolate chia jam peanut butter cups are full of peanut butter and jam flavor. It’s like a grownup version of your favorite childhood sandwich, but you also get to add chocolate! 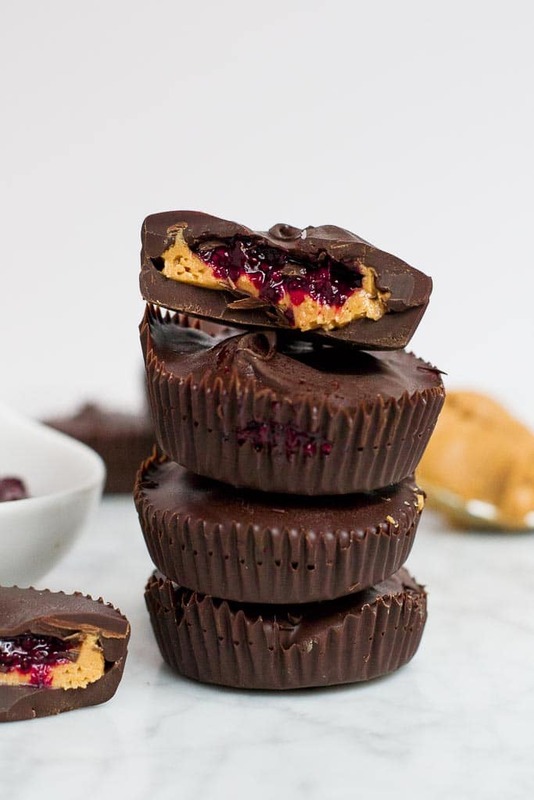 I could say these chocolate chia jam peanut butter cups bring me back to my childhood. But they totally don’t. I actually was a fan of the peanut butter and sugar sandwich growing up. Yes… I said sugar. I wasn’t a fan of soggy bread, so jelly on my sandwiches was not my jam. Instead, I did a little sprinkle of granulated sugar for some extra sweetness and crunch! My mom did this with her sandwiches, and her mom did that same! Who knew traditions could revolve around a little granulated sugar on a sandwich? 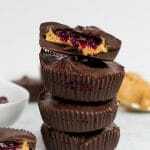 You’ll going to LOVE these chocolate chia jam peanut butter cups, I just know it! There’s something about that peanut butter and chocolate combo that makes me so happy! I also love how customizable these are for those of us with celiac disease or food allergies. You can use your favorite brand of chocolate – mine is gluten-free and dairy-free. If you have a peanut allergy, you can use sunflower seed butter instead. 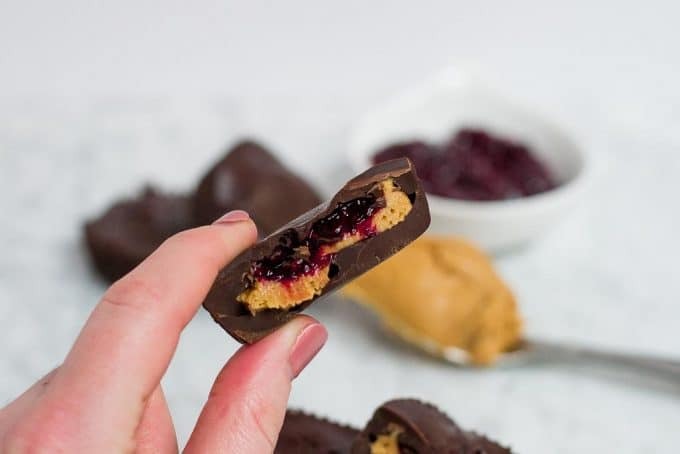 The fact that these chocolate chia jam peanut butter cups are SO easy, I know I’ll be making them all the time to share with my friends and family! You can use whatever type of chocolate chips you like best. I used Guittard extra dark chocolate which is gluten-free and dairy-free. A creamy peanut butter is best for this recipe as you want the center to be thick when combined with the powdered sugar. If you want to cut down time on the recipe, can use any type of jarred jam that you would like instead of the chia jam. Use paper muffin liners. Trust me. I’ve tried going without the liners and it’s a mess! 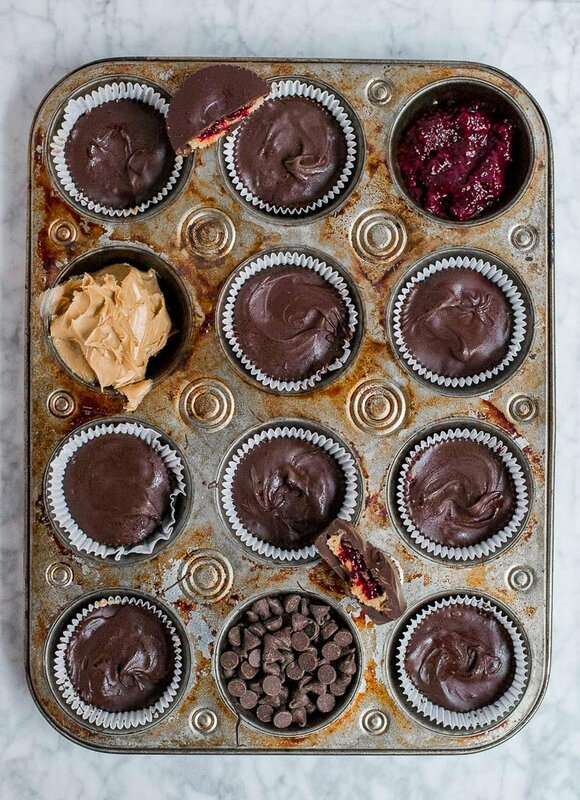 If you want to make the peanut butter cups smaller, use a mini muffin tin and mini muffin liners. You’ll get about 24-30 mini peanut butter cups this way – perfect for entertaining! Dark chocolate, creamy peanut butter filling, sweet berry chia jam – this recipe is an easy no-bake dessert using simple ingredients that is great for entertaining! It’s also gluten-free, dairy-free AND vegan! Dark chocolate, creamy peanut butter filling, sweet berry chia jam - this recipe is an easy no-bake dessert using simple ingredients that is great for entertaining! It's also gluten-free, dairy-free AND vegan! In a medium sauce pan, add frozen berries and granulated sugar. Stir to combine. Bring to a boil, stirring occasionally. The juices from the berries will be released and the berries will get soft. Start crushing the berries with a spoon or spatula. Take off of the heat and let cool and thicken completely. Set aside. In a small bowl, combine peanut butter and powdered sugar and mix thoroughly. Set aside. In a microwave safe bowl, add half of the chocolate chips, reserving the other half for later. Microwave in 30 second increments, stirring in between, ensuring you do not overheat the chocolate as it will burn and seize. The total time should be about 1.5 minutes. Line a muffin tin with paper muffin liners. Spoon the chocolate into the paper liners, just covering the bottom of each cup. With the back of the spoon, push some of the chocolate up the sides of the paper liner to create a well in the center. Place the muffin tin in the freezer for 10 minutes, to the chocolate harden. Once the chocolate has hardened, spoon the peanut butter in the center of each muffin cup. Then top the peanut butter with the chia jam. Place in the freezer again for 10 minutes to allow the filling to set. Place the remaining one cup of chocolate chips in a microwave safe bowl. Microwave in 30 second increments, stirring in between, until the chocolate is completely melted. Top the peanut butter and chia jam filling with the melted chocolate making sure it is completely covered. Tap the muffin tin against the counter to level out the chocolate. Return the muffin tin to the freezer for 10-15 minutes, to allow the chocolate to completely harden. Defrost for at least 5 minutes before serving. Peggy, I am so glad you mentioned the idea of using sunflower seed butter! After all, peanut butter isn’t the only nut butter there is.